Waste-Not-Basket™ products are the ultimate consumer recycling solution. They blend with any décor and make recycling fast, clean and easy while reducing our impact on the environment. To sustain our standard of living we must reduce our impact on the environment. Everyone must take part, recycling at home, at the office and when we travel. That’s why JRS Amenities created the aesthetically pleasing Waste-Not-Basket™ - an attractive and efficient recycling system for home, office and hotels. Made from renewable and sustainable resources with a durable metal frame, they are available in multiple sizes, shapes, colors and three different woven materials – havana, rope weave or wicker. They blend with any décor and make recycling fast, clean and easy. 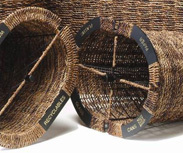 Waste-Not-Basket™ products are the ultimate recycling solution. Going green never looked so good. Millions of eco-conscious travelers are thinking about the environment. Going green is now a way of life. 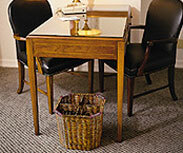 Show your commitment and leadership with this attractive in-room recycling program. 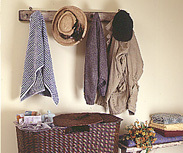 The Waste-Not-Basket™ offers a tidy and effective way to recycle at home. It’s great for kitchen, laundry room, home office or den and comes with custom-fit environmentally responsible plastic bags and custom labels. 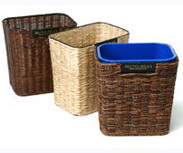 Disguise those unsightly blue boxes by choosing these handsome woven sleeves in either wicker, rope weave or havana. Going green never looked so good! When it comes to recycling we know you want convenience, ease and savings. The Waste-Not-Basket™ allows users to sort and dispose of everything from cardboard to cans. No mess, no stress! Bags, liners and lids sold separately.